LeafSpy Pro is now available from the Apple App Store. 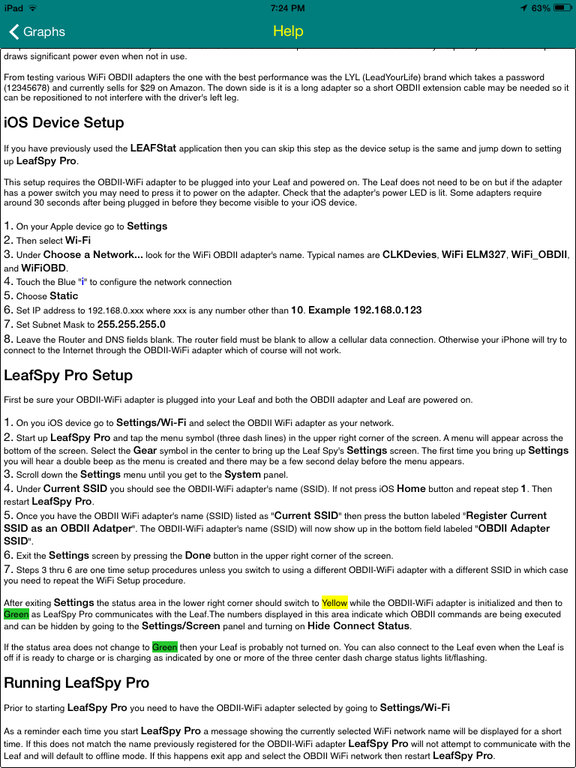 Use this thread to report problems and ask questions about the iOS version of LeafSpy Pro. Runs only on iOS version 7.1 or greater. Requires a WiFi OBDII Adapter to connect to your Leaf. Last edited by Turbo3 on Thu Mar 19, 2015 5:17 pm, edited 2 times in total. Instructions almost fit on one iPad screen. I may cut and paste later so there is no overlap here. Last edited by Turbo3 on Fri Feb 13, 2015 8:39 pm, edited 1 time in total. Helpful tips will go here. Just got my Invite to the Beta & downloaded it. LeafSpy opened right up & grabbed my OBD2 WiFi signal after about 10 sec initially. Now it grabs the WiFi right away when opened. Works with the same WiFi settings as LeafStat and provides so much more info, as well a alarms for low tire pressure! Excited to finally have it on ios - will report back after I paly around with it for a while. Really good stuff on LeafSpy! Got the beta downloaded and am testing on an iPad air 1 and an iPhone 5s, both running iOS 8.1.3. Been using it with LeafStat for 3 months. Love it so far. LeafSpy has ALOT going on, so I will play with some of the features. So far it works fine as far as I know, giving me all the info that LeafStat has plus the individual cell pairs and graphs. What is and how do you set up the elevation thing? Only 3 temp sensors for the battery (sensors 1, 2, and 4 show up)? More as I figure it out! Great stuff. Great to have another app to show these geeky numbers. Last edited by finman100 on Tue Feb 17, 2015 6:32 pm, edited 1 time in total. Only model yeras 2011/2012 have 4 battery temperature sensors. All others have only 3. Elevation should be automatic when you start driving although the first time you use it iOS will probably ask your permission to allow Leaf Spy Pro access to location data. 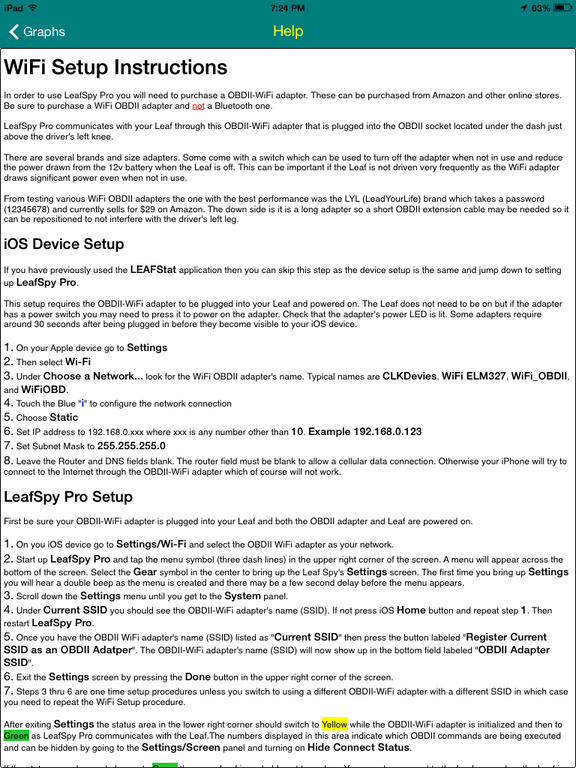 Turbo3 wrote: Use this thread to report problems and ask questions about the iOS version of LeafSpy Pro. This thread is for support questions and help. If you have new feature requests those should go in the development discussion thread along with any beta tester comments. finman100 wrote: Only 3 temp sensors for the battery (sensors 1, 2, and 4 show up)? Depends on what year Leaf you have. Earlier Leafs had 4 temp sensors, later ones only have 3. My 2015 has 3. All seemed to be working well last night. Tried the various screens including service screens. I had graphed a charge session for about 15 minutes or so. I saved the .csv, shut everything down, including closing the app. I downloaded the .csv via iTunes on my Mac. This morning I got in the car and started the app. It came up briefly but there seemed to be a flash and I was returned to the iPhone home screen. I tapped the icon again and the same thing happened. I thought the app had crashed but it was still actually running in the background. I selected it from the running apps instead of the app icon, and it came up. Now that I am not connected to the WiFi, I can close the app and restart it from the icon just fine.